At Dunkin’ Brands, we approach everything we do – from product development to restaurant operations to communications – through a guest-centric lens. We strive to offer all of our guests authentic, high-quality menu items. Our goal is to continuously improve our menu while offering guests the choice and great taste that they expect from Dunkin’ and Baskin-Robbins. To this end, we have menu development guidelines that help us evaluate ingredients, sodium and sugar levels and potential nutritional claims for our products, whether we are developing a new beverage or an indulgent treat. In 2017, we set a goal to remove synthetic dyes from the Dunkin’ and Baskin-Robbins U.S. menus by the end of 2018. As part of our company’s ongoing efforts to offer guests great-tasting, high-quality products and cleaner menu labels, both the Dunkin’ and Baskin-Robbins product development teams, in partnership with suppliers, have been working to eliminate synthetic dyes from food and beverages in the U.S. The exceptions on both brands’ menus include select supplier-branded ingredients produced by other companies. Our goal is to serve guests with a wide variety of dietary preferences and needs – whether they are looking for a dairy-free option, a kosher menu item or lighter fare. We believe our guests should know the nutritional content of the food and beverages they purchase from us. We make all of our ingredient information available on the Dunkin’ and Baskin-Robbins websites and mobile apps, and our customer relations associates are trained on how to respond to the wide variety of nutrition-related inquiries we receive. We also continue to be strong advocates for federally mandated menu labeling in the U.S. so that consumers easily see the caloric content of the food and beverages they are ordering at the point of purchase. While the federal menu labeling law has been postponed to May 2018, all our U.S. restaurants have already invested in implementing the national menu labeling requirements in advance of the law’s requirements. 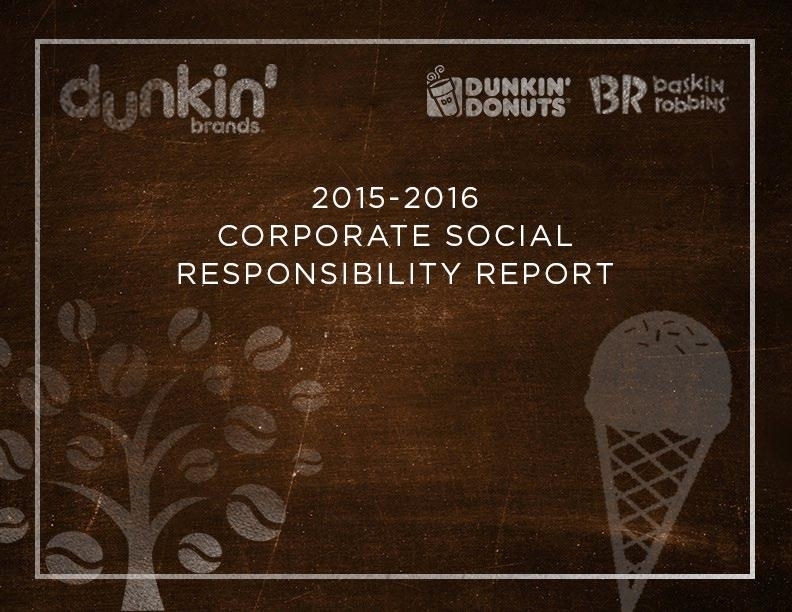 Food safety continues to be a key priority for Dunkin’ and Baskin-Robbins restaurants and our supply chain. For more information, please view our Food Safety Statement. Our guests’ opinions are important to us. We provide our guests with mechanisms to provide feedback on their experiences in our restaurants or with the products on our menu. For more information on reaching our Guest Relations representatives, please click here.